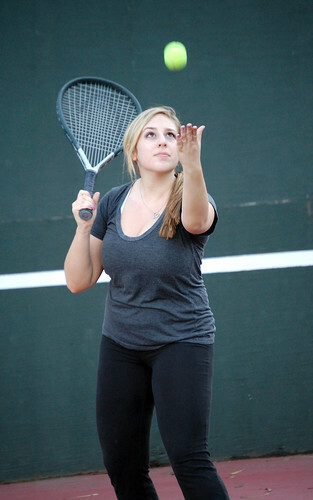 Angela Cooperman, a sophomore, practices with SF State's intermural tennis team on October 6th, 2011. Photo by Cindy Waters. After a hard week of classes there may be nothing more enjoyable than blowing off some steam with friends. One group, tennis team Casual Sets, serves up laughs and exercise with the University’s intramural tennis league once a week. “We don’t judge each other, you know, we laugh it off,” said team captain Sara Suter. Suter created the team with a group of friends, fellow sophomores Devon Brush, Angela Cooperman, Shelby Watson and Gabe Price. The four women wanted the camaraderie and work of a team, but not the time commitment for anything more than once or twice a week, usually on Thursdays at 5 p.m. Despite last week’s wild weather the team showed up ready to play, only to find the other team forfeited due to illness. Still, there were no long faces. While Suter was able to find friends with whom she could form her own team, anyone can become a “free agent” and find a team to play with through the school’s Campus Recreation Department. Interested parties can also find more information at SF State’s intramural website, and there’s a lot more than just tennis available. Sports include basketball, indoor soccer, and even billiards. “(Being on an intramural team) let’s us come out here and have fun and play together,” Brush said. It’s also an opportunity for groups to get creative, especially with the team name. While the other teams wear regular athletic gear, the Casual Sets crew plans to take the next step and make team shirts to play in. Don’t let the tongue-in-cheek names fool you, however. These players take the game seriously. Since the league is coed they needed at least one man on the team, so they asked Watson’s boyfriend. “I’m not against it,” Price said, about being the lone man on the team. He likes to joke about the team name a lot, Watson said. Almost everyone on the team had to purchase rackets so they could play, Suter said, although most had played before. During matches they keep score on their own and there’s no coach to correct their swings, but they’re clearly happy with the status quo. “We’re not too serious, but it’s fun. It’s intramural; we’re not going to be that great – though we are pretty freaking awesome,” she said, drawing laughs from her teammates.